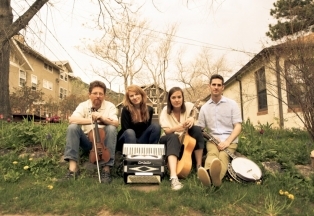 Focusing on songs collected by folklorist and field recording pioneer Alan Lomax, this collaboratory brings together some of North America's most distinctive and creative roots musicians to revive, recycle and re-imagine traditional music. The repertoire includes Bahamian sea chanties, African-American acappella singing from the Georgia Sea Islands, ancient Appalachian ballads, fiddle tunes and work songs collected from both well-known musicians and everyday folk: sea captains, cowhands, fishermen, prisoners and homemakers. The new album will be out on Borealis Records on March 3, 2015. Alan Lomax (January 31, 1915 – July 19, 2002) was one of the great American field collectors of folk music of the 20th century. He was also a folklorist, ethnomusicologist, archivist, writer, scholar, political activist, oral historian, and film-maker. Lomax also produced recordings, concerts, and radio shows in the US and in England, which played an important role in both the American and British folk revivals of the 1940s, '50s and early '60s. During the 30s Lomax recorded thousands of songs and interviews for the Archive of American Folk Song at the Library of Congress on aluminum and acetate discs.